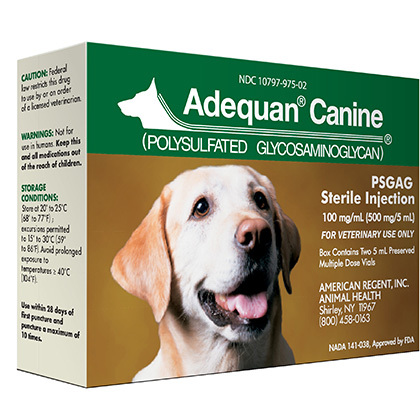 Adequan Canine (for dogs) is used to control symptoms associated with degenerative or traumatic arthritis. It is an injectable polysulfated glycosaminoglycan (PSGAG) and is the only FDA approved product of its type. Adequan has been clinically shown to help treat the disease while giving relief from pain. It modifies the disease cycle, stimulates cartilage repair processes and diminishes joint damage while reducing the pain caused by osteoarthritis. Adequan requires a prescription from your veterinarian. A syringe is needed, but not included in the package. How does Adequan Canine work? What should I discuss with my veterinarian before giving Adequan Canine? Tell your veterinarian if your dog has any known or suspected bleeding disorders. Tell your veterinarian if your dog has any liver or kidney disease. Tell your veterinarian if your dog is breeding, pregnant or lactating. How should Adequan Canine be given? Give this medication exactly as directed by your veterinarian. 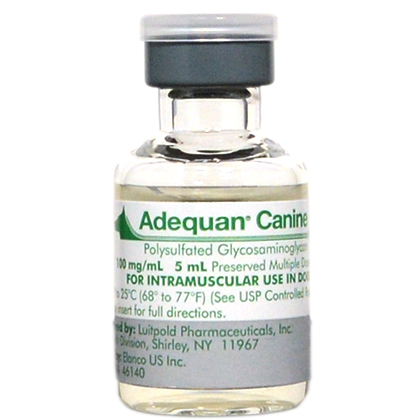 Adequan is given by intramuscular (IM, into the muscle) injection. If you do not understand the directions ask the pharmacist or veterinarian to explain them to you. If you have difficulty giving the medication, contact your veterinarian. Store Adequan at 68 - 77 F (20 - 25 C) excursions permitted to 59 - 86 (15 - 30 C). Keep this medication out of the reach of children and pets. What are the possible side effects of Adequan Canine? Few side effects are seen following Intramuscular injection. Stop giving Adequan and seek emergency veterinary medical attention if an allergic reaction (facial swelling, hives, scratching, sudden onset of diarrhea, vomiting, shock, seizures, pale gums, cold limbs, or coma) should occur. Bleeding from the nose, blood in the feces, or dark and tarry stools may indicate a decreased ability of blood to clot. Contact your veterinarian if you notice these symptoms. Other side effects may also occur. Talk to your veterinarian about any side effects that seem unusual or bothersome to your pet. What happens if I miss giving a dose of Adequan Canine? What should I avoid while giving Adequan Canine? Do not give this medication to breeding, pregnant or lactating animals. Use with caution in animals with kidney or liver disease, or blood clotting or coagulation disorders. What other drugs will affect Adequan Canine? Consult your veterinarian before using any other prescription or over the counter medicines including vitamins and supplements. Store Adequan at 68° - 77° F (20° - 25° C) excursions permitted to 59° - 86° (15° - 30° C). Keep this medication out of the reach of children and pets. Other Ingredients: Sodium hydroxide and/or hydrochloric acid added when necessary to adjust pH. Sodium Chloride may be added to adjust tonicity.